These are the words that Tom and Debbie Misotti choose to live by. They have dedicated their lives to changing the world for the primates they have rescued, largely using their own funds, and for teaching the rest of us how we can live an Earth-friendly existence. Here is Debbie’s description of why they chose to dedicate their lives to this cause and what it means to them. Based on the mind set illustrated in the quotes by Gandhi and Margaret Meade, our project has come to be a primate rescue geared more toward public education about the practical approach to living with all primates, human and non-human, in the this world. We worked to achieve 501c3 status so that we would be approved as a nonprofit charity by the federal government, making us eligible to solicit and recognize donations legally and apply for grants for funding. We both work full time jobs to support the project and receive no remuneration for what we do other than public or private donations that we use to support the animals we have rescued. After years of working as volunteers for many primate projects, sanctuaries and commercial enterprises, my husband Tom and I wanted an opportunity to incorporate many of the ideas gleaned from those organizations into a volunteer project that would inform the public about the perils of extinction for non-human primates. 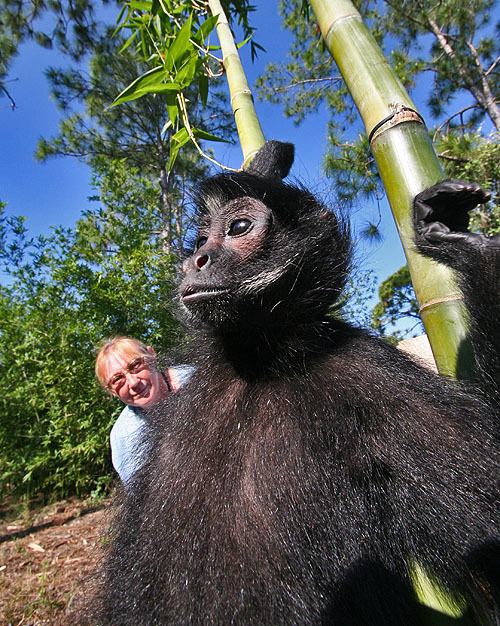 We strive to teach our audiences some of the practical things they can do in ordinary life – that may help the primates of world, while building a symbiotic relationship with them and improving our relationship with the earth itself. We wanted to create a project that would help the public look at the world from a global viewpoint, incorporating simple methods that would teach recycling, environmentally friendly landscaping, practical methods of dealing with the problems nature gives us caused by human naivety and human abuse of the land. Tom is an Approved Professional in the International Green Building Program and as a general contractor here in Florida, he experiences first-hand the lack of knowledge by the general public in Earth-friendly building. Our work with the primates has taught us not only the need for public education, but it has also given us a perfect way to build a more symbiotic consciousness with the environment around us. We try to share this perception of nature and promote more practical ways to approach everyday, ordinary life. We wanted to expand the vision for students of all ages. Our project offers the opportunity to practice what we preach, so-to-speak. Our volunteers not only help care for our primates, they also learn practical recycling, methods of gardening and landscaping, structural practicality and at the same time provide a view of the world from a more global platform. The combination has been a learning experience for us as well. We pride ourselves in pushing our students & volunteers to reach for their dreams and to this end, we create the opportunities for them to flourish in the future. We have managed to arrange mentoring opportunities through internships, shadowing and actual life experiences in the field. We encourage students & volunteers to attend lectures, conferences and travel. All of these experiences enhance their global vision and we hope to brighten the future for the next generations yet to come. The Talkin’ Monkeys Project has been full of challenges we never dreamed of, a broader viewpoint on education, and most importantly a truly rewarding feeling of accomplishment on a level we never would have experienced any other way. The knowledge that we have made a difference in the life of another primate – whether human or non-human has been our ultimate goal. In the long run, it is all that we can leave behind. Planting a seed, whether in the mind of another human or in the earth itself, is all we can do to effect change. We can only hope it is enough.